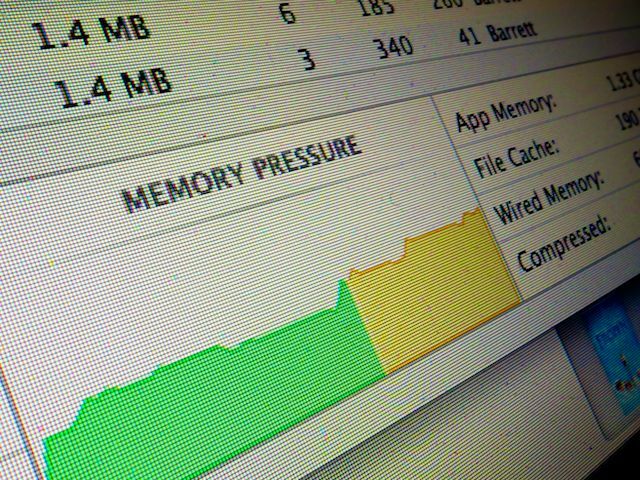 Does your Mac get a headache keeping up with all the programs you’re running? It’s time to dial it back. Activity Monitor can help you decide which programs to shut down. My iMac has been slowing down lately. And then you’ve got to wait around like it’s 1999. You look up…stare into space. Suddenly, you hear the whir of the computer’s fan grow louder. It really shouldn’t be working this hard. So I wondered if it was time to think about a new one. But it’s got 4 GB of RAM and the i7 processor. It shouldn’t be hurting that badly. Doctor Barrett… what’s the problem?! One good maintenance check is to run ‘Repair Disk Permissions’ in Disk Utility. That can speed things up a bit. Unfortunately, that fix didn’t improve the health of my panting processor this time. How much software do you have running simultaneously? No computer is a bottomless bottle of beer. So I sat down with my Mac and we began some self-reflection. Well, first off… I often use Apple’s Aperture to edit and organize all my photos. Then, you might recall I added CrashPlan a while back for automatic cloud backup, in addition to my Time Machine drive. Do I have lots of Safari windows open? Plus I see, Dropbox, Word, Outlook…. Already, it’s getting to be a pretty large list. Maybe I’ve been maxing out my Mac after all. So how are you supposed to know how much weight your Mac can bench press? Yes, Apple has, of course, thought of that. The answer comes in the form of a little utility called Activity Monitor. It lists all of your open programs, charts the drain and graphically displays the ‘memory pressure’ your poor computer is enduring. There’s lots tech jargon to consume, but it’s immediately clear which programs are depleting your digital companion. And then you can close down the particular offenders directly in Activity Monitor. I’ve opened Activity Monitor before, but it was more out of curiosity than need. This time, I went in and saw some Safari pages ‘not responding’ and putting a pretty big drain on the system. Click…. See you guys later! That seemed to do the trick… but then I didn’t close out of my nifty new window into my Mac’s brain. I left it open and positioned it in the top left corner of my screen. Now, it’s always there to help me see what’s going on and which hungry programs are grabbing more than their fair share. Yes, a newer Mac or more RAM would also solve the problem, but really, how many programs do you need to have open simultaneously? When I was a kid at home, my mom always pestered me to turn off all the lights in the room I just left. “That’s just wasting electricity,” she’d say knowingly. And how much memory does it taken to run Activity Monitor 24/7? Could this reveal a circular logic flaw…? As I write this, Activity Monitor is sipping a miniscule 14.7 MB. By comparison, Word is consuming 148.3 MB. And CrashPlan is gulping 698.3 MB. By comparison, Activity Monitor is a welcome dose of aspirin to clear up your headache and keep your computer focused on what really matters in the moment.